This past fall I bought fifty pounds of German Butterball potatoes. They’re a hearty, dense, and waxy-fleshed heirloom variety. They don’t get flaky or mealy when cooked. They’re like a Yukon Gold only better, I think, because they have a thick skin that is delicious. Cooking them whole (or in their packets as the Brits say) is my favorite technique because the skin holds in the flavor. I start them whole in a pot of cold, salted water then bring them to a boil, and turn it down to a sturdy simmer, testing the potatoes with the tip of sharp narrow knife to feel how their done-ness is coming along. I’m looking for more resistance and undercook the potatoes because I like to put them away in the fridge to use later. They’re the most versatile ingredient to have on hand. You can cut them into a stew or braise they soak up the spices and juices and still hold their firm texture. And for breakfast, shredded into a golden crispy hash brown that spit and sear in a hot skillet of salt and fat like lard, ghee or vegetable oil. Incredible. Or as mashed potatoes with butter, cream and nutmeg to top off a Shephard’s Pie. Something really good happens to any cooked potato that rests in the refrigerator for a day because when you revive them they’re tastier, rootier and more useful. I know it’s almost spring when I have to reach deeper into the darkness of that tall paper sack the farmer sold those fifty pounds in. I’m shoulder deep now. The handfuls that I’m bringing up to the light are sprouting to save their lives with their baby-fat ghoulish white sprouts reaching randomly toward the light – they’re determined and strange-looking. Potato sprouts will make you sick if you eat them because they contain a bitter compound called solanine. 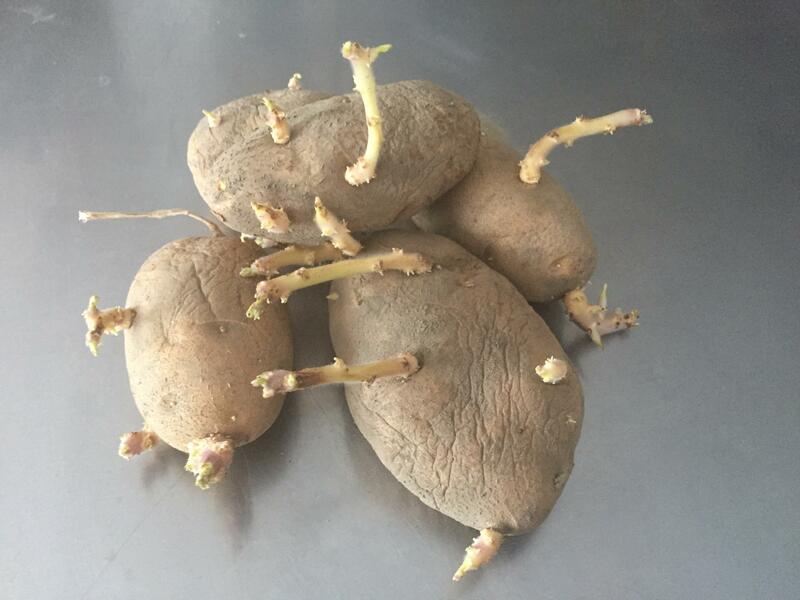 Sprouting potatoes are in the process of converting starches into sugars to support the new growth. They’re still edible once you peel them (unless they’ve total gone past, all shriveled and mushy) but they lose that earthy potato-ness that cooking them in their thick skin protects. When I get my next fifty pounds in the fall - I’m going to try a storage system I learned from Tom Hodgson and Christine Gault of West Tisbury and Falmouth. They showed me how to improvise a root cellar that’s really clever and inexpensive. 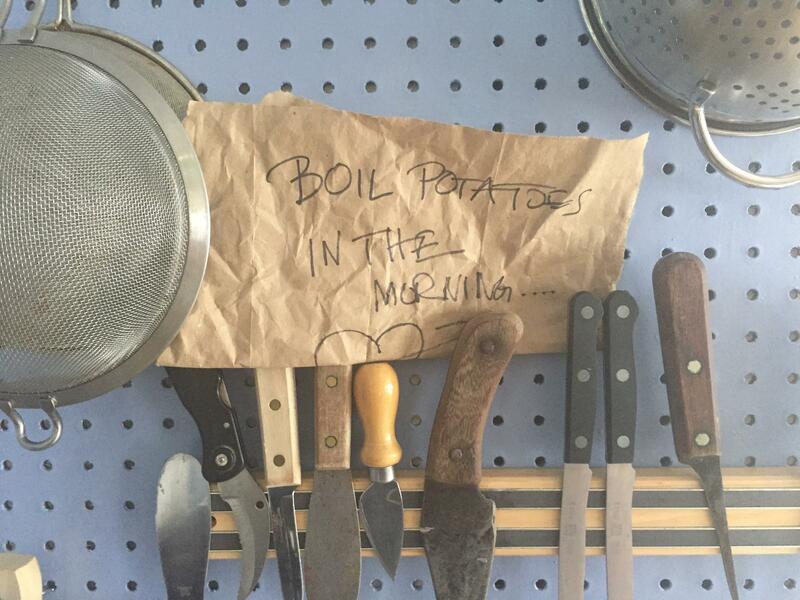 People go to all kinds of trouble to make root cellars, but Tom and Christine have found a different way to make the potatoes last. He says, "Since we're both cheap and lazy we find that keeping potatoes in sand in a plain old plastic tote works remarkably well." He adds, "we have one buried outside in the garden, but we also keep the food we'll be using in the near term future right here in the crawl space. It's cheap, it's simple, it's easy, and it's handy." That cool, dark, dry environment helps to keep potatoes from sprouting. With this big bag of potatoes and me, the cook, it’s like we’ve been kitchen-dancing together through the long, deep shadows of winter quiet. Now that the potatoes are emerging into spring with new their growth, I’m coming out of it too - to find warmth, and sunlight and whatever’s next. It’s inevitable these ways of nature for both plant and animal - the determination and reaching for the next day, every new morning. Richard Bailey is a pretty serious amateur forager. Every few months, he calls to tell me about a new wild food. Most recently, he took me to see a black walnut tree growing down the street from his house in Wellfleet. The tree is less than a foot in diameter, and fairly young.